The Grateful Dead's final concerts are still a week away, but the band has announced plans to release both the audio and video from the historic shows. Fare Thee Well: Celebrating 50 Years of Grateful Dead will become available Nov. 20 in a variety of formats. Over at dead.net, the band's official site, pre-orders are now available for the Exclusive Complete Version, which will contain 12 CDs and seven DVDs or Blu-rays that include all three concerts, with a bonus disc produced by Justin Kreutzmann featuring backstage footage and the parking-lot scene at Chicago's Soldier Field. This version is limited to 20,000 individually numbered copies, and can be ordered for $189.98 (Blu-ray) and $174.98 (DVD). The last concert, July 5, will be sold as a four-CD/two-DVD/Blu-ray set ($59.98 for Blu-ray, $54.98 for DVD) or the video alone. A two-CD audio compilation of the highlights from all three nights will be available for $19.98. Both the final concert and the highlights will also be sold as digital downloads. News of the discs comes less than a month after the group announced the Sept. 18 release of 30 Trips Around the Sun, a limited-edition boxed set containing 30 previously unreleased Grateful Dead concerts spread out over 80 CDs (it lists for $699.98). 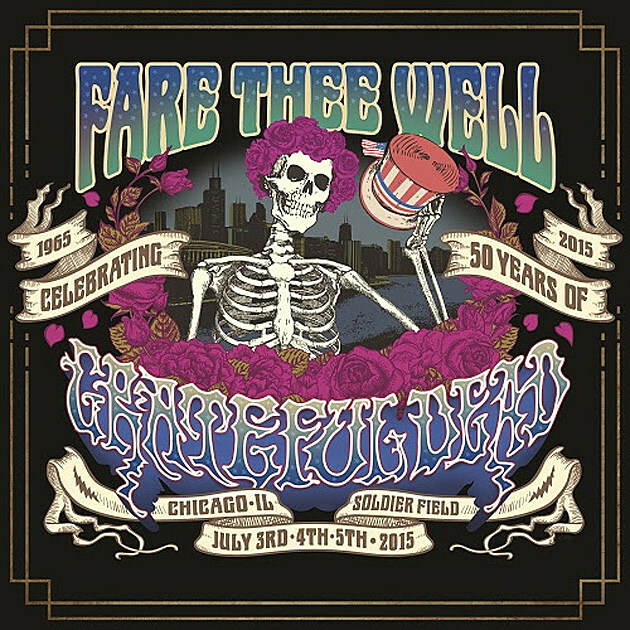 The Fare Thee Well concerts, which will be held July 3-5 at Soldier Field, will find the four surviving members of the Dead -- Bob Weir, Phil Lesh, Mickey Hart and Bill Kreutzmann --augmented by Phish frontman Trey Anastasio (guitar), Bruce Hornsby (piano) and RatDog keyboardist Jeff Chimenti. Prior to the Chicago dates, the group will play two nights at Levi's Stadium in Santa Clara, Calif., on June 27 and 28.